Not fit for mixed company. Utterly indecent. Such are the phrases that come to mind when contemplating Homegrown Smoker‘s sloppy BBQ delicacies. Homegrown Smoker is hands down my favorite food cart in PDX. Even though they specialize in down-home cooking, HS’s flavors are often surprisingly complex. It’s not often a restaurant features both remoulade & rutabagas, and deep fried pickles & oreos. 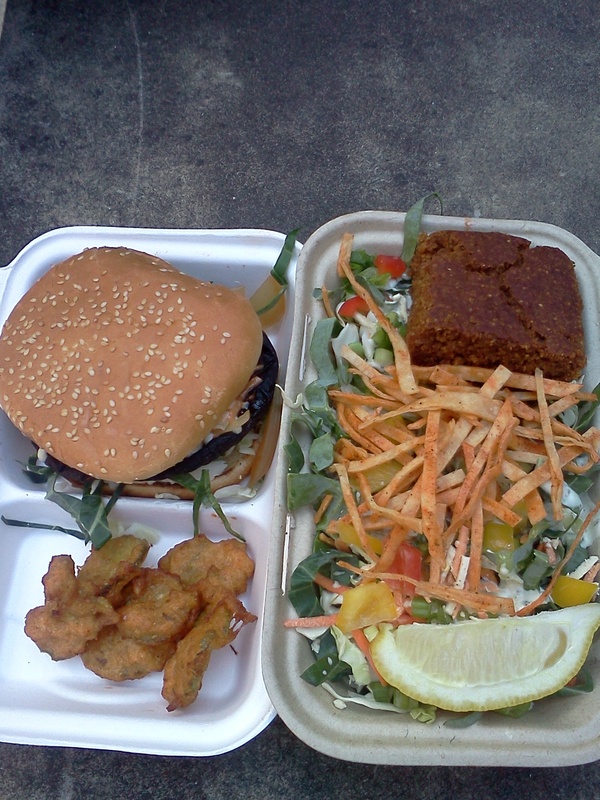 Among the many standouts from their standard menu is the Smoker Salad: Soy curls, baked beans, cabbage and collards, tortilla strips, diced peppers, onions, daiya cheese & ranch, with a slice of molassas cornbread (left, with the Smoked Shroom Burger and Deep Fried Pickle Spears). The Portorrito: a burrito with smoked portobello and vegan mac nocheeze! Yeah, that’s right: mac’n’cheese in a burrito!! Keep an eye on their blog, which features daily specials. Our last meal in Portland (and possibly the best we had) was one of their featured sandwiches, the Philthy NoCheezesteak. 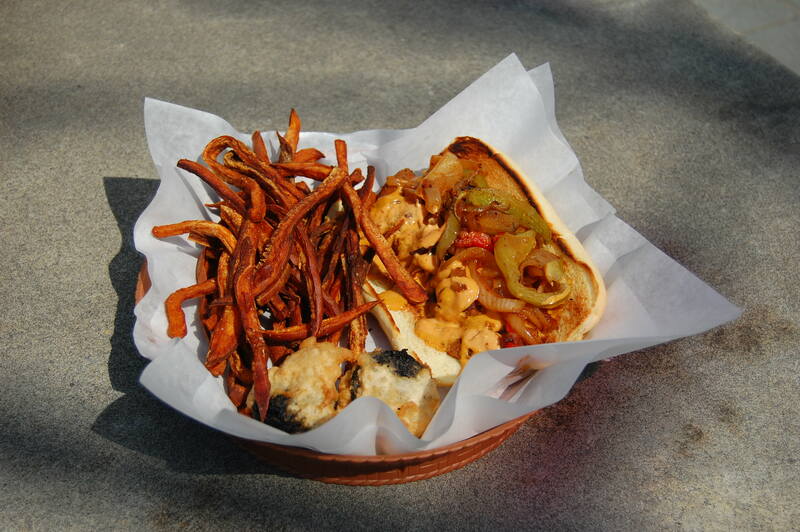 Here we have the sandwich, sweet potato fries, and lurking in the front, those innocent-looking lumps of white and black, are none other than OREOS DEEP FRIED IN COCONUT BATTER. How can something so wrong taste so right? But hey, vegans need a little more fat every once in a while (on the off chance you’re not already getting more than your fair share from Voodoo Donuts). Go eat, be amazed, build up some winter paunch, and be sure to wash your food down with a mint lemonade. P.S. They’ll deep fry anything on request.